ANYANG, South Korea and CHICAGO, Nov. 28, 2017 /PRNewswire/ — Vieworks, a leading provider of integrated imaging solutions, exhibits its various products, including its latest flat panel detector, VIVIX-S 1417N, with new features for addressing a busy workflow in medical facilities at RSNA 2017. 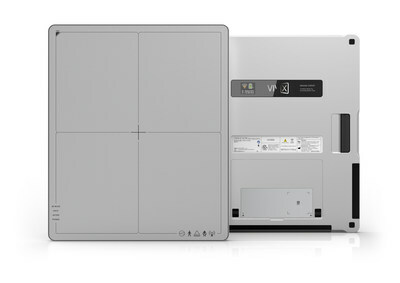 In February, Vieworks received FDA clearance for its VIVIX-S 1417N, a 14-inch-by-17-inch flat panel detector for general radiography. Joseph Choi, strategic marketing team leader for Vieworks, says that AnytimeTM, Vieworks’ automatic exposure detection (AED) feature, which takes away the need for a cabled connection between the X-ray system and generator, helps set the detector apart from the company’s competitors. "AnytimeTM is well recognized for superior AED performance in the industry for its high reliability and high sensitivity without compromising image quality compared to a DR line trigger," Choi says. AnytimeTM uses a separate AED trigger sensor, and the VIVIX-S 1417N does not create artificial defects as the whole of the flat panel detects X-ray signal to create images, Choi says. Anytime is also highly sensitive to the X-ray dose, sensing doses as low as 10 nanogray, still providing high-quality images. The VIVIX-S 1417N is the first Vieworks’ detector to use Near Field Communication (NFC), which allows for quick and easy configuration, so clinicians don’t have to struggle with complicated settings when they use the detector in multiple X-ray rooms. Clinicians can also swap batteries without turning off the detector. The VIVIX-S 1417N is also dust and water resistant, has enhanced durability with low maintenance costs and offers faster wireless communication, allowing for quicker throughput for mid and high-tier hospitals. Vieworks offers the most advanced flat panel detectors for digital radiography and digital fluoroscopy. Since 1999, Vieworks has been one of the leading manufacturers of X-ray detectors with advanced digital medical imaging processing, robust hardware design, and excellent usability. The in-house R&D team at Vieworks designs, develops, and manufactures to provide the best solution for your needs. Vieworks software, including the image acquisition application and streamlined PACS system, has various tools that will enhance the daily workflow at medical facilities.